The cut of a diamond refers to two things. 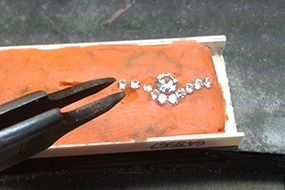 First, to the way the master cutter turns a rough diamond into a cut gemstone. 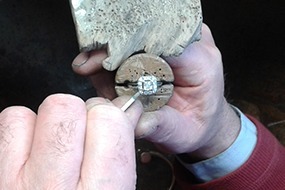 This is crucial as it determines how the diamond treats light- the better the cut, the more sparkle it will have. Cut also refers to a diamond's shape; there are many shapes available, ranging from the familiar Brilliant and Baguette cuts, to the more unusual Princess, Marquise and Asscher. Most diamonds carry natural ‘inclusions' - miniscule birthmarks invisible to the human eye. Inclusions take the form of internal or external flaws, clouds and black spots, all of which prevent light from passing through the diamond. Therefore a diamond with the highest clarity will be most brilliant, and most valuable. A diamond with no inclusions is extremely rare and referred to as ‘flawless'. Most diamonds contain a slight hint of colour and for many this is a desirable trait. But the most sought- after diamonds are colourless. These allow light to pass through the stone effortlessly, dispersing it again as a rainbow. 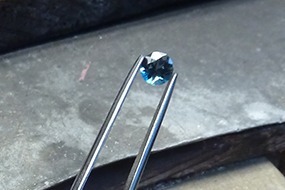 Only 8% of the finest diamonds are considered colourless. 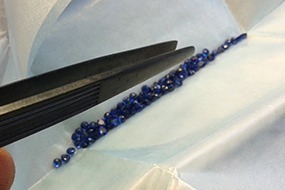 Carat is the unit of weight applied to a diamond and is often considered its principle quality. A diamond's value increases exponentially as its carat increases, so a 2 carat diamond is worth significantly more than double a 1 carat diamond of the same quality.